Josh's table looked very busy. His laptop was open, and so were his books. The iPod was playing loud music in the background, but he was texting on his iPhone. Rosh got into his bed, and smiled at him. Josh turned around to nod at his father, then put away his iPhone. "Acharya Dron," Rosh said, "was the Royal War Arts Teacher for the young princes of the Kingdom of Hastinapur." "Arjun was his favorite archery student. All other students envied Arjun because they thought he was the teacher's pet." "Why do you think Arjun is the best among us all?" they would ask him repeatedly, but none of his answers doused their jealousy. "To prove to other students once and for all, that Arjun really was the best archer amongst them, Guru Dron decided to conduct a mid-term test." "Be at the arena when the sun climbs over the horizon tomorrow," Guru Dron announced, "ready with your bows and arrows. We are going to have an archery competition to determine the best archer". "This created a buzz in the Gurukul, which was kind of like a Boarding School. All students polished their bows. They sharpened their arrows. They tested their quiver strapping." "Next morning when they gathered, their glossy bows and pointed arrows gleamed in the sun behind their backs. The wind was still, but their hearts fluttered with excitement." "Guru Dron arrived. After having a wooden bird hung high from a tree, he declared that the student who pierced the bird's eye would be the winner." "First the eldest prince, Yudhishthir, was invited to try. 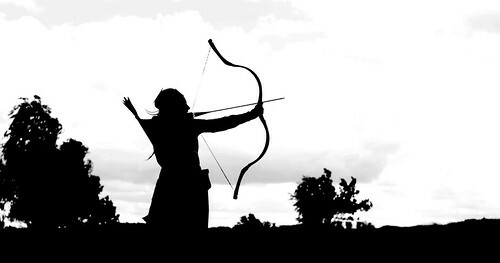 He plucked an arrow from the quiver, placed it on the bow, steadied himself, and pulled the string." "What do you see Yudhishthir?" Dron asked him when he appeared ready to release his arrow. "I see the bird hanging from a branch," Yudhishthir answered. "And the sun, and clouds behind the trees," he replied as he released the string. The arrow shot forward, missing its target completely. Dron nodded and asked him to step down. Then Dron invited other students to shoot one by one. He asked them the same question as they readied to shoot their arrows at the bird. Suyodhan said, "I see a bird on a tree." Ashvathama, Dron's son, said, "I see you, the bird and the tree." Bheem, the eternally hungry prince, said, "I see the bird on the tree ... and the kitchen behind the tree." Sushasan said he had conjunctivitis. He couldn't even see properly. And so on it went. One by one, they shot their arrows but kept missing their target. Finally, it was Arjun's turn. When he had taken his stance and readied to shoot, Dron asked him the same question. Arjun replied, "I see the bird's eye." "And only the bird's eye," Arjun replied as he let go of his arrow. The arrow shot forward with a swoosh and went straight into the bird's eye. Guru Dron was very pleased. With the answer as well as the shot. "Why do think the others couldn't shoot the bird's eye?" Rosh asked. "Because they failed to concentrate on their target," offered Josh. "Correct", agreed Rosh. "It wasn't because Guru Dron had taught Arjun anything special, but because the rest lacked the focus required, to shoot like Arjun." "Unlike them, he was not distracted by constant text messages on his smartphone or by WhatsApp beeps while he was trying to shoot. He had his iPod switched off while aiming and no earphones dangling from his ears." "That is why he saw only his target, and nothing else. And succeeded, where all the others had failed." "He did not aim with his hand. He aimed with his eye. He did not shoot with his bow. He shot with his mind. He did not kill with his arrow. He killed with his heart." "Do you think you could train your eye, mind and heart, to become my Arjun?" "Pa!" Josh moaned, got up and left his father alone in his room.